Laurie at Mediterranean Cooking in Alaska and The Well-Seasoned Cook Susan are celebrating legumes with the ninth installment of the My Legume Love Affair event – and I am happy to join in. 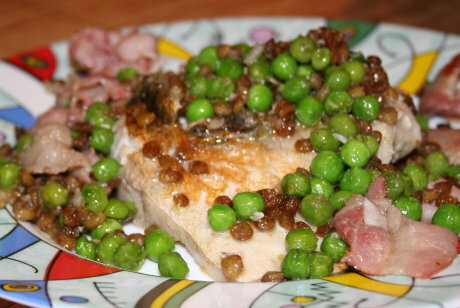 For the event, I chose a recipe from the BBC Good Food magazine, titled Braised peas with bacon, lentils & cod. I didn’t use cod, though, because I still had two lovely fillets of zander (or pikeperch) sitting in my freezer. I have to admit, though, that the cod on the Good Food website looks a lot better than my dish. I like the simplicity of this dish, and it is put together in a breeze if you use canned lentils, as suggested by the recipe author. I opted for dried (pardina) lentils which were cooked in homemade stock, which adds 30 minutes to the cooking time, but I really don’t buy canned lentils ever (and using them would have required to buy a large can just for the few tablespoons I actually needed). The peas came from a bag in my freezer. To make the pea braise, heat half the olive oil in a shallow saucepan, then sizzle bacon for 5 mins until crisp. Turn the heat down, add the peas to the pan, then cover and braise for 8-10 mins until peas are tender (about 5 mins if you’re using frozen peas). Add the lentils to the peas and cook until heated, then remove from heat and dress with lemon juice, seasoning and a bit more olive oil, if necessary. Just before serving, stir through the mint. Meanwhile, heat the butter in a frying pan until frothy, then add the fish, skin-side down, and cook for 4 mins until the skin is crisp and the fish almost cooked. Flip the fillets over and cook for 1 min. Divide the peas between 4 plates and top with fish. Drizzle with olive oil and serve with a wedge of lemon. In particular, I like the combination of the peas and the lentils, bringing together the sweetness of fresh peas and the nutty taste of the pardina lentils. The combo is great with the fish, and the bacon adds just enough zing to spice things up.